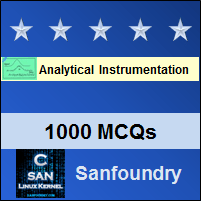 This set of Analytical Instrumentation Multiple Choice Questions & Answers (MCQs) focuses on “Operation of Chromatography”. 1. Which of the following steps takes place after injection of feed in Column chromatography? Explanation: The operation that occurs after the injection of feed is a separation in the column. After that, elution from the column and detection of components takes place. 2. Components with a strong attraction to the support move more slowly than components with weak attraction. Explanation: Different components will adsorb to the stationary phase in varying degrees. Components with a strong attraction to the support move more slowly than components with weak attraction. 3. What happens during the ‘elution from the column’ phase in chromatography? Explanation: During the elution phase, different components elute at different times. Components with least affinity elute first. 4. In chromatogram, the position of peaks on the time axis can be used to determine which of the following? Explanation: Chromatogram is a detector that responds to concentration solute and is placed at the end of the column. The position of peaks on the time axis can be used to determine components of the sample. 5. In chromatogram, the area under the peak can be used to determine which of the following? Explanation: Chromatogram is a detector that responds to concentration solute and is placed at the end of the column. The area under the peak can be used to determine the amount of component in the sample. 6. The stationary phase could be a viscous liquid coated over a surface of solid particles. Explanation: The stationary phase could be a viscous liquid coated over a surface of solid particles. The solid particles can also be the stationary phase. 7. 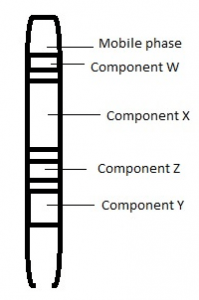 Given below is a diagram of separation of two components of a mixture in a chromatographic column. From the diagram, infer which component has lesser affinity to the stationary phase. Explanation: Y will elute from the column first. Components with least affinity to the stationary phase will elute first. 8. Using Chromatogram as detector in Chromatography, a graph is obtained between ____________ and time. Explanation: Using Chromatogram as a detector in Chromatography, a graph is obtained between concentration and time. The detector is placed at the bottom of the column. 9. In older analytical methods, which of the following methods were used to allow movement of the mobile phase? Explanation: In older analytical methods, gravity facilitated the movement of the mobile phase. The effect of capillary action was also employed to allow movement. 10. 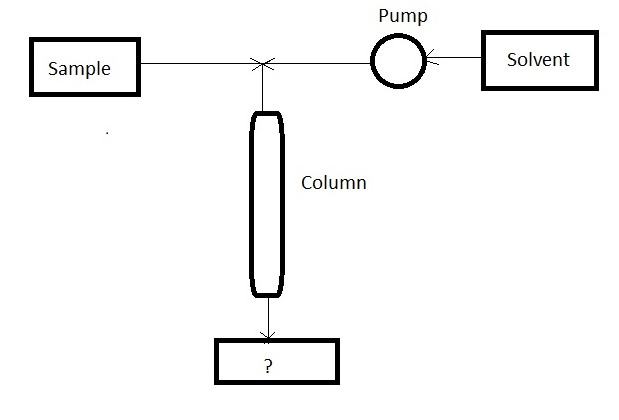 Given below is the diagram of ‘Process of chromatographic column’. Identify the unmarked component in the process. Explanation: The unmarked component is detector. It is placed at the bottom of the column. It responds to solute concentration.